(Gallatin County, Mont.) On Sunday August 10, 2014 Sheriff’s Search and Rescue units were sent to South Cottonwood Canyon South of Bozeman to rescue an injured mountain biker. The call came in about noon. The Bozeman woman in her 40’s was carrying her bike through a bad portion of trail when she got her foot entangled on something in the trail and fell. This occurred about 4 miles from the trail head in steep, single track terrain. 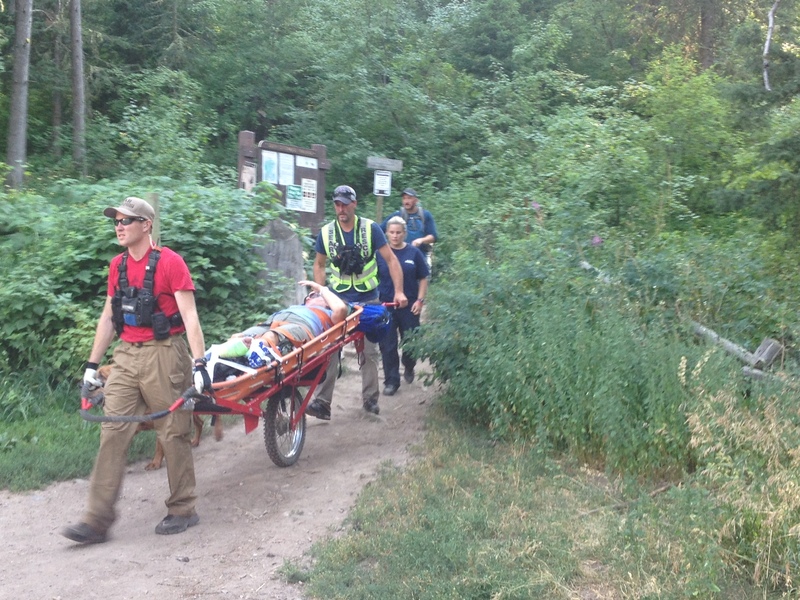 With the assistance of Gateway Fire Dept and AMR ambulance 10 rescuers hiked in for an hour and a half and using a specialized one wheeled stretcher carried her out to the trail head where she was transported by ambulance to Bozeman Deaconess. The crash was reported by her riding partner who had to ride 2 miles down trail to get cell service and dial 911. It took rescuers almost 4 hours to navigate the woman down the trail. Sheriff Gootkin stated that mountain biker rescues present special challenges for SAR. They can travel greater distances and are typically found in areas of steep, narrow and tree covered terrain where rescuers are limited in how they can reach and then carry them out. It is pretty quick to ride a bike or motorcycle into those places but you can’t carry the gear you need to bring someone that is injured out the same way. If you break an arm or leg it is pretty hard if not impossible to ride yourself out on some of these trails. We owe a lot to the volunteers that spent their Sunday afternoon doing this hot and difficult work. He asks that people reporting emergencies in the back country either meet the Deputies at a trail head or stay where they have cell service. Directions to take the left fork is useful except there is always more than one fork to take. Having someone to guide rescuers in can save a lot of time. At about 5:30 P.M. just after finishing the Cottonwood rescue SAR volunteers were dispatched to the Blackmore Mountain trail for an injured hiker. 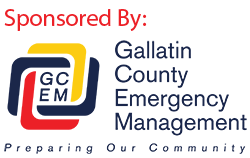 A long time Gallatin County Resident had hiked to Blackmore and he also fell and injured his ankle. Because of the distance involved and knowing it would be dark before Rescuers could evacuate him, causing greater risk to the volunteers, a contract SAR helicopter was used to transport him to the Hyalite parking area. Sheriff Gootkin remarked that these are our typical kinds of Rescues. The majority of our missions involve local folks responsibly enjoying the vigorous outdoor lifestyle our area has to offer. Occasionally they have a bad day. Photo courtesy of Gallatin County Sheriff’s Office.